As Minister of Tourism, Civil Aviation and Culture, I am extremely saddened by the sudden passing of David Friedman known among us as Mott Green. Green was a friend of Grenada and entrepreneur who worked tirelessly to promote our cocoa and by extension our country. At the Ministry of Tourism, Civil Aviation and Culture we feel a strong sense of sorrow for this loss to Grenada. 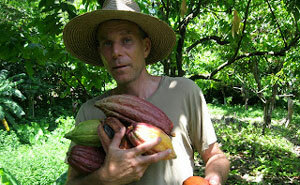 Mott’s passing is also a blow to cocoa exports, in light of the campaign he has been leading. Our heart goes out to his family and friends and indeed employees of his company — the Grenada Chocolate Company, as well as, his family at the Belmont Estate. Mott, from the ground up, passionately led the creation of a company that manufactures and exports this country’s cocoa and while increasing Grenada’s profile internationally. He also provided employment for our people. We feel that as part of our tribute to our friend Mott and to his legacy that we all work together to ensure his company continues to grow from strength to strength. We are confident that Mott’s chocolate factory has a vibrant role to play in a refreshing new economy that is unfolding in this new administration and we are certain he would have been happy to be a part of it.